Be the first to share your favorite memory, photo or story of Charles Edsel. This memorial page is dedicated for family, friends and future generations to celebrate the life of their loved one. 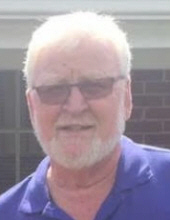 Charles Edsel Keene, 67, known to some as "Bud," passed away early Wednesday, July 18, at Vidant Medical Center in Greenville. Mr. Keene, a retired truck driver, was a resident of the Summerlin's Crossroads Community near Mount Olive. He was the son of the late Lathan Edsel Keene and Mary Ellen Myers Keene. Funeral services will be held Friday, July 20, at 11 a.m. from Rooty Branch Free Will Baptist Church, officiated by the Rev. Mickey Whitfield, with burial following in the Goodman Family Cemetery located beside the church. The family will be receiving friends in the fellowship hall of the church immediately after the committal service, and at other times at the home. In lieu of flowers, it is the wishes of the family any memorial gifts be made to the Keene Grandchildren's Educational Fund, and given to a member of the immediate family for deposit into a trust account. Mr. Keene is survived by his wife, Joanne Green Keene, of the home; a son, Charles Franklin Keene and wife, Kelly, of Hope Mills; a daughter, Leslie Keene Gregory and husband, Donald, of Mount Olive; six beloved grandchildren, Dylan, Raegan, Braylon, Emerson, Cohen, and Elaynna; three sisters, Ellen Stokes of Mount Olive, Bonnie Jones and husband, Dexter, of Nashville, Tenn., and Wanda Blackwell and husband, Tony, of Hartsville, SC; three brothers, Jerry Keene and wife, Terry, of Micro, Tommy Keene and wife, Jenny, of Selma, and Ronnie Keene and wife, Patsy, of Mount Olive; and a number of nieces and nephews. To send flowers or a remembrance gift to the family of Charles Edsel "Bud" Keene, please visit our Tribute Store. "Email Address" would like to share the life celebration of Charles Edsel "Bud" Keene. Click on the "link" to go to share a favorite memory or leave a condolence message for the family.